Quite a leisurely start to our day today. Rolled up the road around 9:45 AM to find breakfast, and while the Boy Scouts pancake offering was finished, the Rotary folks were still set up in the high school up the road, and man, that was one of the best breakfasts we’ve had in a long time. The sausage was Colarains links that the folks got from a place called CJ’s just across the river in the next town. Man, was that great sausage! We asked because we hoped we could pick some up to go with us, but since we’re not leaving until tomorrow (Sunday) we figured they’d be closed. Too bad. Several things I’ve neglected to mention so far: Some poor ghee is dangling from a hammock under a “tent” just down the way from RV City. Jack took a picture of it, but it doesn’t show the hammock itself beneath this stretched thingie. It simply tipped down last night with rain. I wonder how he did in the weather (including thunder and very bright lightning), and what about the mosquitoes after dark? Finally, there are the frogs we hear serenading our ride along the way in all the damp and wet areas. Tons and tons of frogs. Several of whom we saw squashed on the road during our ride today. Anyway, we rode the 40-mile route today, which was much the same beginning as the path we pedaled yesterday, but thank goodness the wind was not as fierce. Pavement was better that yesterday, too. 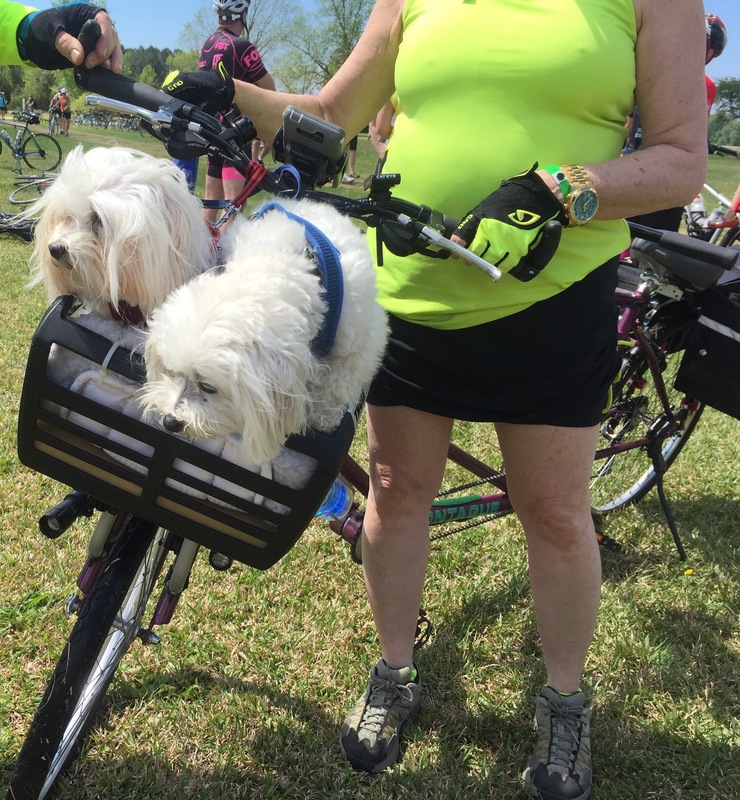 Along the route, at one of the rest stops, we saw a tandem bicycle coming in with, in addition to the two people pedaling, two fuzzy mutts in a basket on the front handlebars. It was a hoot and I asked them to let me take their photos before the dogs jumped out. Later I saw another dog in a drag-along basket. That may be how we take our own doggies along on some of these trips with us: tow them behind the bikes in a carrier. Heavy Chase would be in heaven, but I believe Mischief might be a bit antsy riding and not being able to run. We rolled back into town and went on a search for some milk for my morning tea (the small amount I’d brought with me went off). Ended up at an old-fashioned drug store with a soda fountain and got a couple of milk shakes to “restore our energy.” They also were kind enough to sell us a cup of milk for .75. A nice shower later, and we had a beverage back at the camper, caught up on some correspondence, and gave our first tour of the Mr. Blue Roomba Alto. A nice fellow named Ken came over and said he’d been researching Safari Condo trailers and he and his wife were planning a trip to Quebec to see some in person, but hadn’t gotten there yet. “I’ve never been this close to one before” he said. The rain began again as we were talking Alto, and they ran over to their unit (a “GO” trailer) to batten down the hatches. Part of our registration included a dinner and social tonight including live music and lousy beer, so we waited in another line (I know you’re surprised about that) for about an hour to get our “free” dinner and a beer that we could not drink. Happily, the rain had stopped by this time. After dinner, we gave another trailer tour while we mapped our timing and route from here to Virginia Beach tomorrow. Seeing that it might take as much as 2 or 2.5 hours to drive up there, we feel sure we can take the 30 mile cycling route and have plenty of time to pack up and roll out of Edenton at a decent hour tomorrow.